MILAN (Reuters) – Former Fiat Chrysler chief executive Sergio Marchionne has died after a 14-year career in which he helped to rescue the carmaker, the news arriving on Wednesday moments before the group reported a surprisingly heavy fall in profit. The announcement of the death of Marchionne, one of the auto industry’s most tenacious and respected CEOs, drew tributes from rivals and tears from his closest colleagues, a collective grief that overshadowed a big sell-off in Fiat Chrysler shares. He had fallen gravely ill after what the company had described as shoulder surgery in a Zurich hospital. 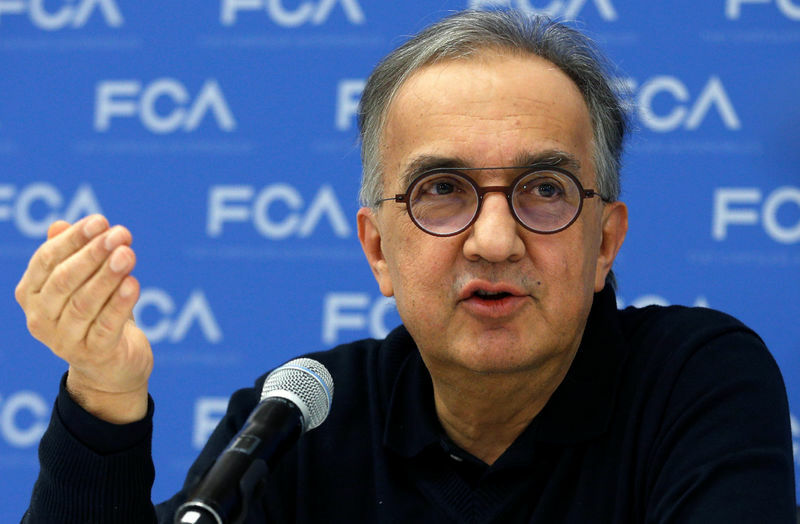 He was replaced as chief executive last weekend after Fiat Chrysler (FCA) said his condition had worsened. FCA’s scheduled second-quarter earnings presentation, led by Marchionne’s successor and former lieutenant Mike Manley, began on Wednesday afternoon with a minute’s silence. On Saturday, Marchionne was also replaced as chairman and CEO of Ferrari (NYSE:) and chairman of tractor maker CNH Industrial, both spun off from FCA. Underlining the task facing Manley, FCA cut its full-year profit outlook after the weaker-than-expected quarterly earnings. It blamed the result on a weaker performance in China, a market that represents one of the new CEO’s immediate headaches. He gave up the quest when his preferred target, General Motors Co (NYSE:), rejected his advances and focused on fixing FCA’s finances first, notably erasing all debt, which he achieved in the quarter to June. Marchionne resurrected one of Italy’s biggest corporate names and revitalized Chrysler, succeeding where the U.S. company’s two previous owners – Mercedes parent Daimler and private equity group Carberus – both failed. “Sergio Marchionne was one of the most respected leaders in the industry whose creativity and bold determination helped to restore Chrysler to financial health and grow Fiat Chrysler into a profitable global automaker,” said Ford Motor (NYSE:) Co Executive Chairman Bill Ford Jr.